The first in a series of children's books about traditional Herero culture. Jahohora and First Day is a creation myth and that is, in itself, something of value. Readers are indirectly asked to ponder why things are the way they are. Could things be different? Do I play a part in helping things become different? “Jahohora and First Day” is a narrative about a young girl and these are some of the questions that are unobtrusively implied. The text is presented in three languages, English, German, and Otjiherero. The author, Mari Serebov is the author of Mama Namibia and adopted daughter of the late Herero Paramount Chief Kuiama Riruako. We are first introduced to Jahohora’s family: her mother who is about to give birth to a baby and her brother who is trying to be one up on his sister when challenging her to a race. The family’s cattle are central as the way the family makes a living, and “the first day” concerns the way ancestors came to life by stepping out of a “omumborombonga tree.” The children’s mother explains that “lions and leopards, . . . wildebeests and baboons”–all the earth’s creatures had stepped from the omumborombonga tree. As a picture book, one must largely disregard the illustrations since they are designed as something that is more functional than artistic. Clearly the role of the illustrations is not a prominent one. Traditional Herero culture, we are told, will be part of a series that will focus entirely on this culture. 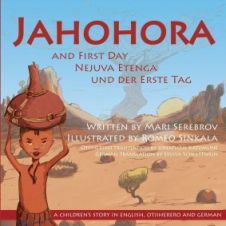 Jahohora and First Day is a welcome addition to the education of everyone and is part of such a series.